Collections are at the heart of a museum. A museum’s exhibitions and research are built from its collections. The significance of collections means it is important to acknowledge those who have contributed. Te Papa’s Botany collection of plant specimens has recently seen notable milestones for two of its biggest contributors: Research Fellow Patrick Brownsey and Research Associate Peter Beveridge. 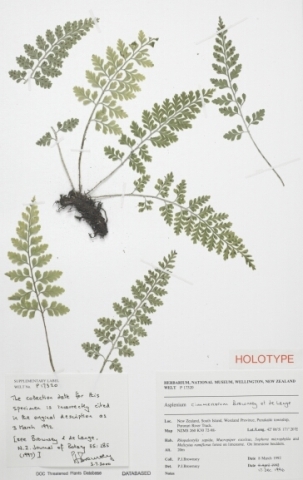 Peter Beveridge has collected over 5000 plant specimens for Te Papa. These are mostly mosses and liverworts. These are small plants; in this image, Peter is using a hand-lens for a closer look. Indeed, precise identification often requires examination with a microscope. Photo Leon Perrie. © Te Papa. Peter volunteers his time and expertise to help Te Papa develop its collections. In his retirement, he has become expert with mosses and liverworts. Few New Zealanders are knowledgeable about these individually tiny but ecologically significant plants. Te Papa (and the nation) is fortunate to have his help. Since 1999, Peter has collected a whopping 5552 specimens (and the total is ever-growing). This includes over 4000 specimens of mosses, representing more than 400 species. There are also more than 1200 specimens of liverworts, representing more than 300 species. Peter has collected the fifth most plant specimens for the museum (about 2% of the total), and the third most by a non-staff member. The moss Sematophyllum amoenum, occurring as a green smear on wood. It is common, but similar to other species – the need for close inspection to confirm its identity may explain why Peter has collected this species more than any other. Photo by Leon Perrie. © Te Papa. Peter apparently has an inordinate fondness for the moss Sematophyllum amoenum, which he has collected 49 times. 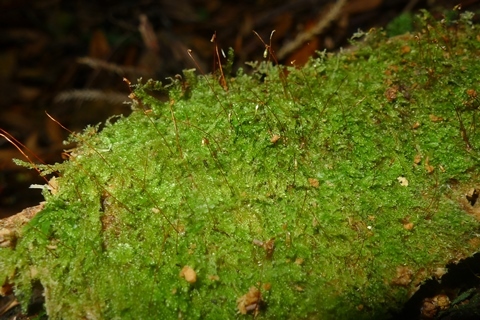 Other popular species – all mosses – are Camptochaete arbuscula (42), Zygodon intermedius (40), Macromitrium gracile (39), and Fissidens leptocladus (38). Peter has made collections from much of New Zealand. 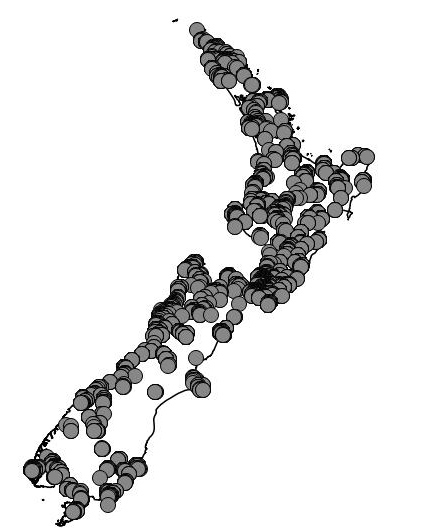 The Ecological Regions from where he has collected the most are Northwest Nelson (529), Tararua (406), and Eastern Wairarapa (355). Map outline from LINZ, CC-BY. In 2013, Peter co-authored a scientific paper describing a liverwort – Lejeunea hodgsoniana – that had been first found by others. Subsequently, he has worked on papers describing several new species of liverworts that he has discovered. Pat has worked for the museum since before the year dot. He was a Botany Curator, but now works as a Research Fellow, fulltime on externally funded research. Pat Brownsey. Research Fellow at Te Papa. Photo Norm Heke. © Te Papa. Pat’s research focuses on ferns, and he has described at least 14 new species or subspecies. 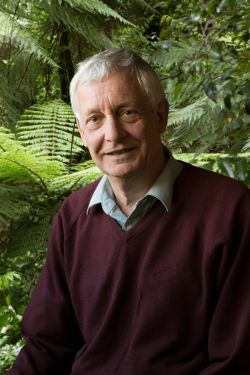 He has authored or co-authored over 100 scientific publications, including the book New Zealand ferns and allied plants. Pat is now working on the fern component of the electronic Flora of New Zealand. More on the electronic Flora of New Zealand. The holotype, or name-bearing specimen, of the cave spleenwort, Asplenium cimmeriorum. One of the new species that Pat named (this one in conjunction with DOC’s Peter de Lange). Collected by Pat, in 1992, from Punakaiki. P017320. © Te Papa. Pat has over 2500 collections of more than 500 different species of ferns and lycophytes. But the majority of Pat’s collections are mosses, with nearly 7000 specimens representing more than 450 species. Popular ferns for Pat are the spleenworts Asplenium gracillimum (51), Asplenium hookerianum (34), and Asplenium flaccidum (33). His most collected mosses are Thuidium furfurosum (83), Sematophyllum amoenum (79), Achrophyllum dentatum (78), Bryum billardierei (77), and Cyathophorum bulbosum (72). The only people with more (databased) plant collections in Te Papa than Pat’s 10 214 are Walter Oliver (13 598), director of the museum 1928-1947, and Donald Petrie (11 408), a school inspector from Otago who donated his personal collection to the museum in 1922. Walter Oliver in Te Ara. Donald Petrie in Te Ara. People with the most databased plant collections in Te Papa. Pat’s collections cover New Zealand. 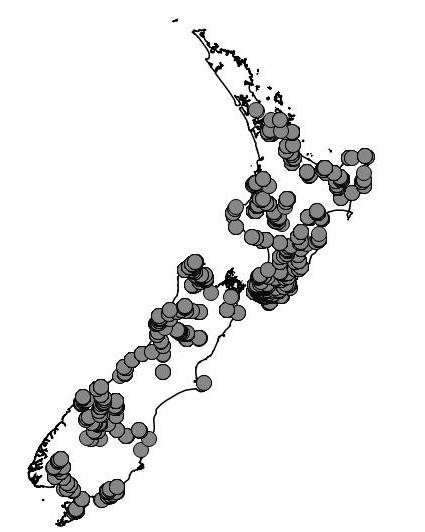 The Ecological Regions from where he has collected the most are Sounds-Wellington (686), North Westland (516), Tararua (507), and Coromandel (463). He also has made hundreds of collections from Australia and the Pacific Islands. Map outline from LINZ, CC-BY. 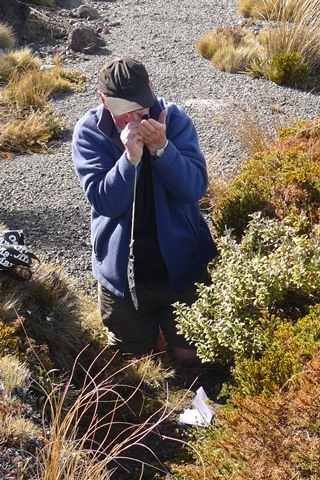 Between them, Pat Brownsey and Peter Beveridge have collected 30% of Te Papa’s nearly 37 000 moss specimens. The rest have been contributed by some 560 different collectors. Pauline Mayhill (c. 22 000) – mostly snails. Treaton Price (c. 21 500) – mostly fossil vertebrates. Walter Oliver (c. 17 000) – mixed, including plants and birds. David Roscoe (c. 14 000) – mostly snails. Trevor Worthy (c. 12 000) – mostly fossil vertebrates. Of the above, only Walter Oliver was a staff member of the museum. Among the current natural history staff, Patrick Brownsey and Alan Tennyson (c. 7500, mostly fossil vertebrates and birds) have the most (databased) collections. Well done Peter, that was fast work. I see we have to get Peter to Northland to look for Sematophyllum amoenum. And to Waimate. That South Canterbury-North Otago gap shows up well in both maps. Nice work lads. Looking forward to the next paper Peter. That’s impressive. Thanks for the information. Congrats Pat and Peter! I am very honoured to be able to call both of them my colleagues, and am very fortunate to work with them in Botany at Te Papa. Kudos to Leon for picking up on this and writing it up in the blog. Well done to both of them! Comparing the two collectors maps, I see an area of the South Island in common (around Timaru) that neither appear to have collected from. Road trip anyone? Well, we are preparing a proposal for a collecting trip to Waimate for this October. Fantastic milestones, well worth celebrating. Thanks for bringing these to the public’s attention Leon.